When was the last time you failed at something? How did you feel? What did you do next? Think about the three questions above after you have read this short blog. 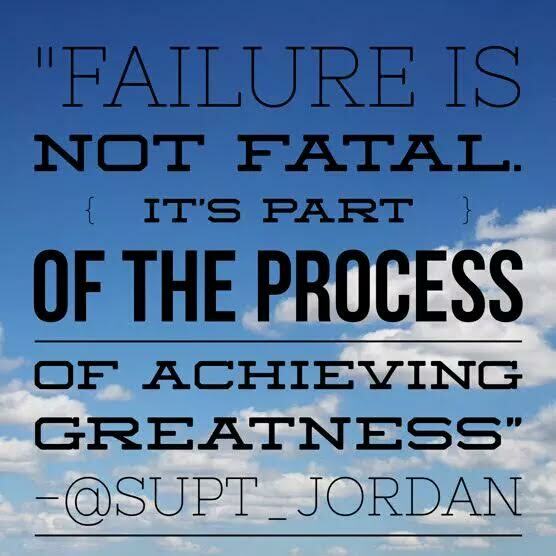 Why do we continue to put a negative emphasis on failing? Nobody wants to fail. As your children go back to school, I would like to tell you something that might sound completely out of the box. Give them permission to fail. As crazy as this sounds, I think it is vitally important for the up-bringing of today’s children. We all have heard of how successful people failed before they became successful. What we learn through the process of failure is far more important than the failed task itself. Failure does not have to be fatal. Instead I’ve seen this; which makes way more sense. Let it be heard around the world that it is O.K. to fail. With that said however; it is not O.K. to give up. Life is not completely peachy. Success is not automatic. You will fall down. What is important is that you get back up. How many of you suffered from test anxiety? How many of you still do? What if we took the pressure off? As we begin a new school year, I have come up with a few tips that each of us can live by that will help us do just that. Society is filled with millions of pressures. You don’t have to try to be somebody that you are not. It is O.K. to be yourself. You don’t have to be good at everything. Failing at something is not the end of the world. With that said; don’t give up. If you believe in something and you have a dream, don’t let failure be the end all. You can achieve and keep pushing forward. Having the permission to fail does not mean that you get to sit back and relax and do nothing the entire school year. You must try. You must keep moving forward. You must bounce back and have a positive attitude. Remember this if nothing else; failure does not define you, it’s what you do after that does. Help alleviate some of the pressure your children are feeling. Give them permission to fail. This will lift much of the stress and anxiety that they may have built up. Be there as a support for them when they fail. Be there to high-five them when they accomplish something. Do not live your life through your child. Do not put unrealistic expectations on your child. Help your child by giving them tools that will help them along the way. Let it be known to them that you will love them if they fail, and you will love them when they succeed. Encourage your children at all times. Right now we have things backwards. We have time as a constant and learning is the variable. These two things need to be switched around. Learning needs to be constant and time the variable. If a child fails a test or an assignment – allow them the opportunity to do it again. If a child cannot show mastery by taking a pencil-paper test, allow them to show mastery in other ways. Also, rethink deadlines. What is your ultimate goal with a project or assignment? Is it to meet a deadline or for the child to master a skill? Allow your students to be innovative. Allow them to collaborate and communicate with each other. Finally, allow them to be creative. These are the competencies that our children will need when they graduate. The permission to fail does not just apply to our children. Give yourself permission. By doing so, you will feel more comfortable taking risks. Stepping outside of our comfort zones and taking risks will help us realize our full potential. We have the ability to do amazing things. Just stop fearing failure. Embrace it and fail forward. When adults take risks and fail, our children will do the same. One step back and two steps forward….you have heard it before. Let’s live by it.